That’s how Greg Ehemann, senior vice president of sales for Shoptech Software, headquartered in Hartford, CT, and a provider of E2 Shop and E2 MFG software, describes ideal fabrication-job-shop ERP software. Ideal job-shop-management software can provide what-if scenarios when considering new work, exploring how the new work will affect existing jobs. From there, the software can derive a schedule for production equipment and provide it to all relevant company personnel. Ehemann should know. He started Shoptech (www.shoptech.com) in the late-1980s with his brother, and the company’s software emerged from the experiences gained in the job shop they grew up in. Assessing those ripple effects, before they manifest, is key. This includes a list of all the jobs that will be rescheduled to accept the pushed-up deadline, and how that will impact materials, machine usage and a host of other variables. In his frequent meetings with job-shop fabricators, Ehemann frequently hears the same concerns from those researching shop-management software. MetalForming asked him to elaborate on these concerns. 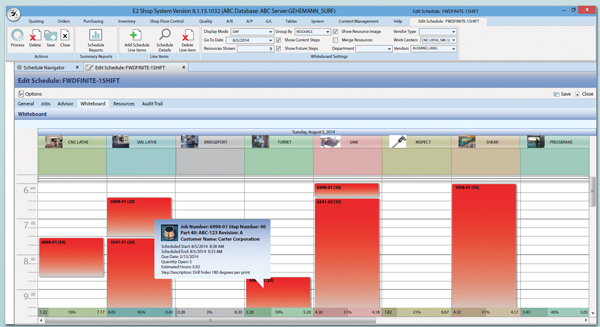 Without job-shop management software that can process a wealth of information and provide detailed analysis, job-shop fabricators may not know the extent to which these pressures affect the business. 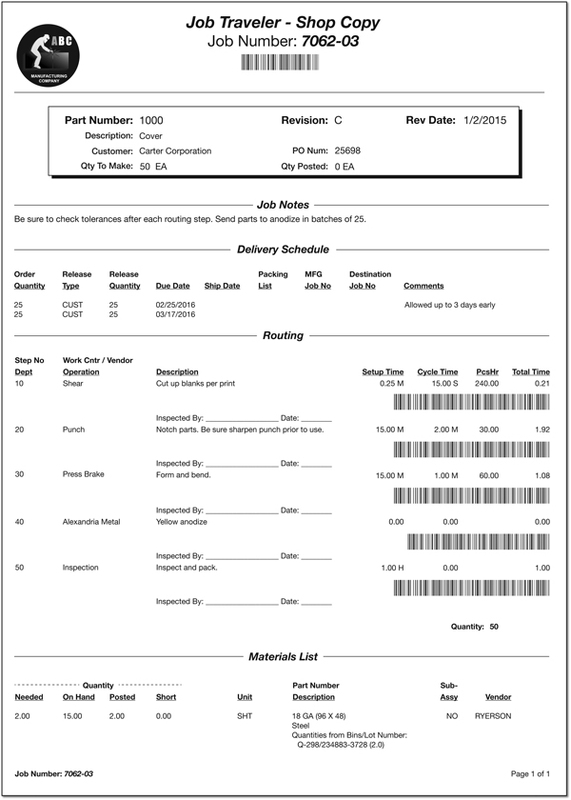 A job traveler sheet contains all tracking and job information for a particular part, helping to ensure that it moves through production as efficiently as possible (for inhouse and outsourced work) while tracking accountability for every step of the process. Quoting is another area where job-shop-management software can pay big dividends by detailing where a fabricator is winning and losing. Ehemann goes on to explain how a shop management system can operate and assist fabricators from beginning to end. With a job in the queue, shop-management software can monitor and analyze all aspects of that job to ensure timely completion. “Not only can it track inhouse operations, but outside secondary processes such as heattreating and plating,” explains Ehemann. “Some software, such as ours for instance, can create a routing sheet that travels the shop to inform production personnel on when parts have to be ready for, say, heattreating, and when we expect those parts back. From Ehemann’s account, it sounds like job-shop-management software is an excellent tool for fabricators. Of course, software that tracks and analyzes all aspects of a business requires an implementation period. How does that proceed, and is it painless?